Check out Naomi's blog for more updates! but here is what is happening so far. 2. What are the wardrobe requirements? As an avid time traveler for some time now I tend to be more conservative, business casual is usually my choice of apparel. Of course this depends on what time we are returning too. If it's the 80's (which I'm praying it is) I like to be a little more creative. I also have a silver trashbag, which is always my default. If we happen to be traveling to the 20's I would like to wear something really fancy so I can flash my money around while the rest of the country suffers financially. 3. Is your haircut the same as in the picture? If so, please confirm, as I would think it best we match. I will buzz my hair to a mullet accordingly. 4. You mentioned weapons- I see you are a veteran who has been stuck in a wild terrain with rabid tribes without a proper defense tool far too many times. As have I. 5. I have a bulldog named Larry I would like to bring. 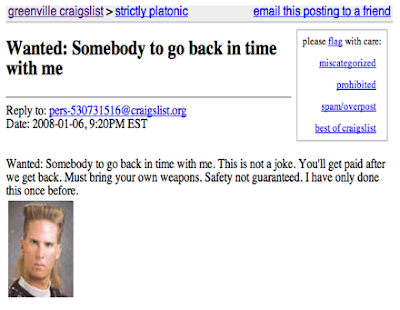 He's somewhat partial to time travel. I would like to bring him. He can also be used as a weapon/food source. Hey, you never know right? 6. Can we go to Las Vegas when we get back? 7. How does the submission process goes? Do I need to interview first? Or is approval based on your telepathic powers?